Rain has come again. Extraordinary season. There is so much happening in the grove, and it’s still only September. 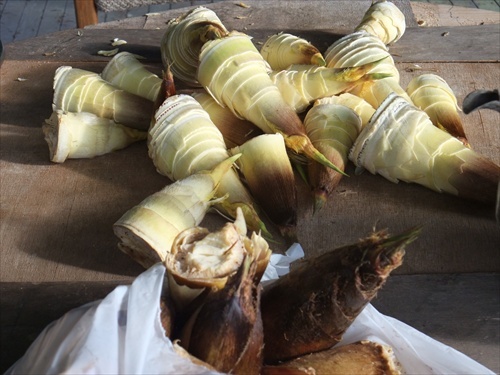 Bamboo shoots can be combined with rice in many ways: the combination is a classic across Asia. The pre-cooked shoots, in fairly fine slices, can be combined with raw rice and both ingredients can steam together till the rice is done. Lately I’ve been using brown rice, and flavouring very simply with turmeric. Get your shoots and ready them in the way shown previously on this blog. 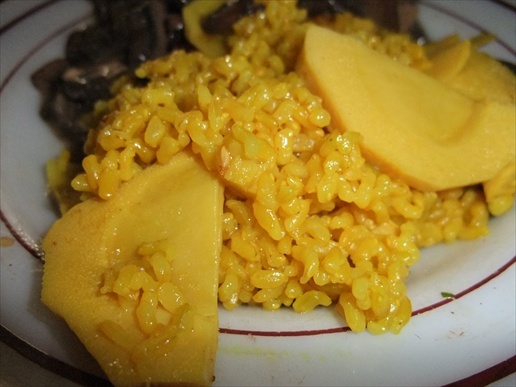 The cooked shoots are added to raw brown rice and pressure cooked by absorption method. The result is good enough to eat alone, can be topped with cheese and olive oil, topped with sesame oil and coarse salt, or topped with any of the usual rice flavourings, such as furikake. Make lots, because excess can be used in many ways that aren’t even Asian. 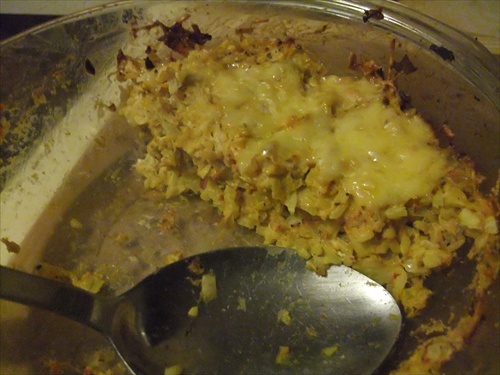 Here I’ve beaten a big duck egg, minced onion and some nutmeg into the leftover shoots-rice, stirred in some parmesan, topped the lot with Colby cheese, and baked as a gratin. More leftovers? It’s a pity that this batch was cooked with turmeric and not saffron, because on day three we have a snapper from one of the angling neighbours, and the weather is suddenly cold. Fish soup ingredients! It might seem a waste to turn snapper into soup, but its broth is superb, and lately I’ve had plenty of it grilled. The whole snapper is poached very, very gently in stock, then taken out to cool a little. 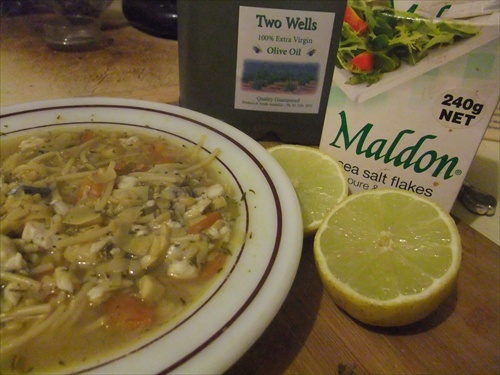 A soffritto of minced soup veg is fried up in olive oil and added to the stock with our bamboo shoots rice. Cook thick. 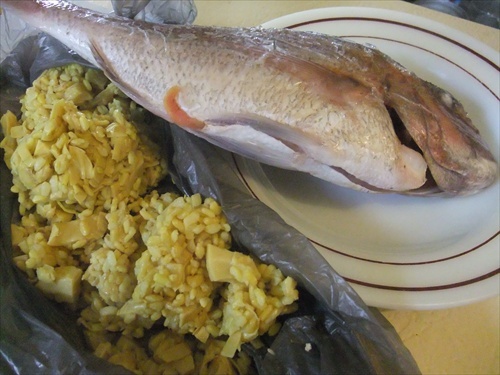 Before serving, the flaked fish is added back to the soup. 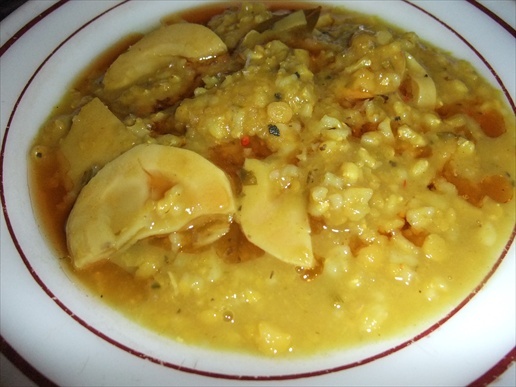 This recipe would be soupier and better with bamboo shoots and white rice, especially if cooked with saffron. Still good. The point is, once you understand prep and pre-cooking of shoots, you can use them for many European style dishes. 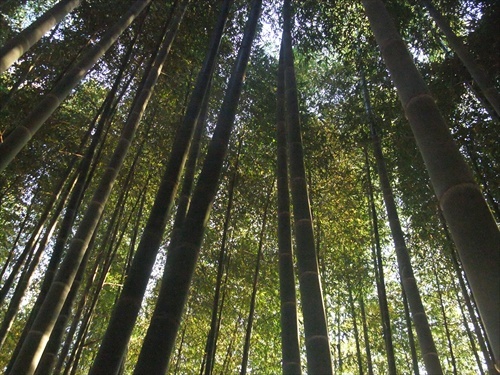 Of course, it helps to have your own bamboo forest. 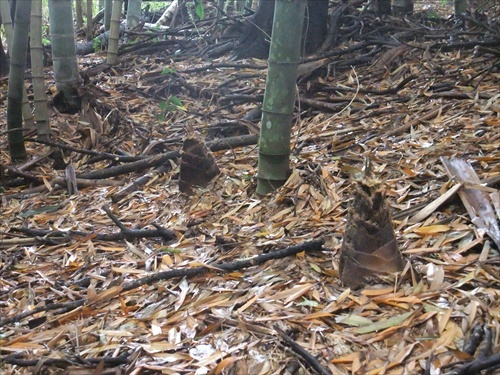 CONTROL OF MOSO BAMBOO. YOU EAT IT. You can shape and control a number of ways. My way is simply to harvest and eat new shoots. After shooting time, there’s no control needed. But one must be prompt at shooting time. 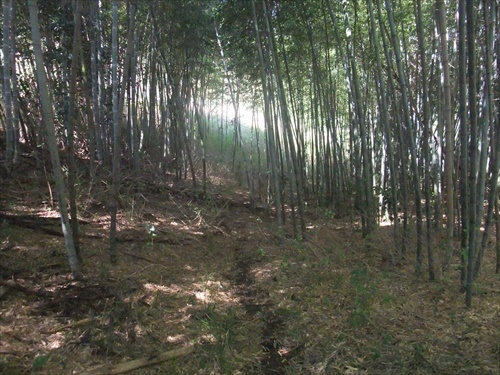 Here is a picture of the area under the lines, taken inside the grove. All new shoots have been removed for some years now, within a strip extending some metres outside the power lines. 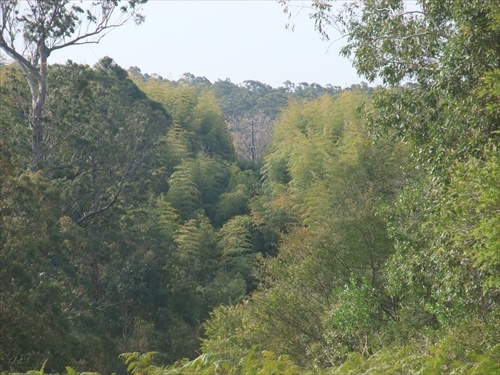 Juvenile culms, which were never tall enough to reach anywhere near the lines, have been left in place. This gives the grove stability and keeps down unwanted species. 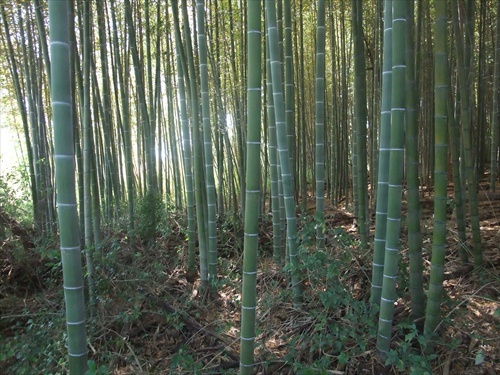 The electricity people don’t like this, because, like most people, they are convinced that bamboo culms continue to grow after their first seven weeks of existence. 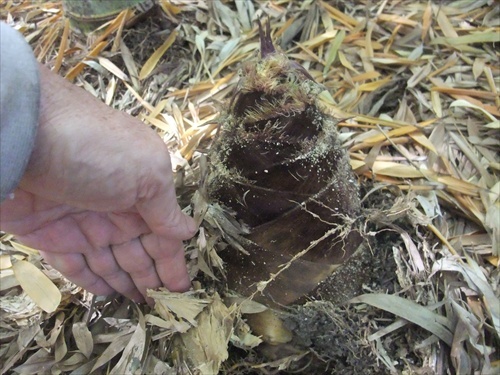 It’s a hard thing to grasp: that a shoot a few inches tall will tower up to eighty feet within weeks, while a culm from a previous season will never grow by a fraction of an inch – ever! 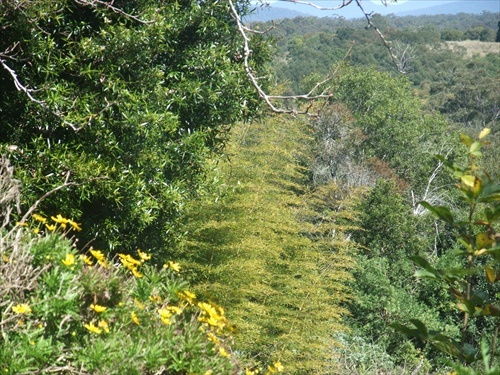 Note how the grove in the top picture has a burnished-yellow appearance. 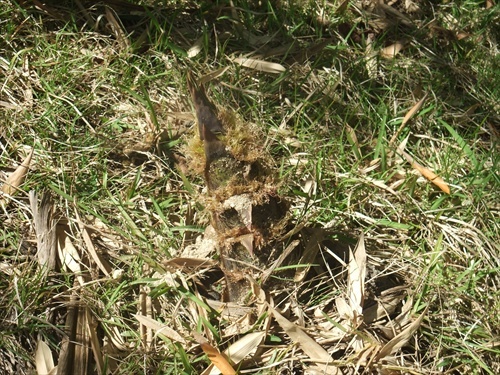 That’s because we are now in bamboo autumn, which is spring, when moso puts all its energy into new shoots and withdraws it from everywhere else. Here on the hot western edge you can see the yellowing near one of this year’s first shoots. Because this season is so good, the leaf-loss and discolouring are not as extreme as in past years. 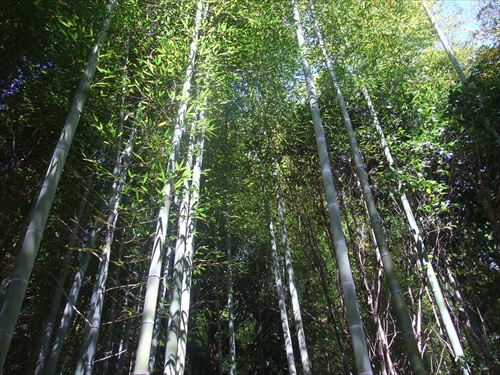 A few metres into the grove, the bamboo still looks quite fresh. There’s still plenty of shade under the canopy in the centre. 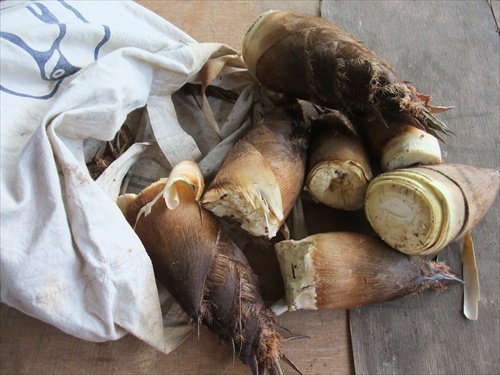 Bamboo shoots are supposed to have health benefits because, among other things, they contain woody substances called lignins which are lacking in the diet of modern humans. Really, I wouldn’t know. But one great quality of shoots is their gentle but powerful effect upon the bowels. I don’t normally have problems in this regard, but when I eat moso shoots I definitely don’t have problems. A couple of dozen more shoots were harvested yesterday. 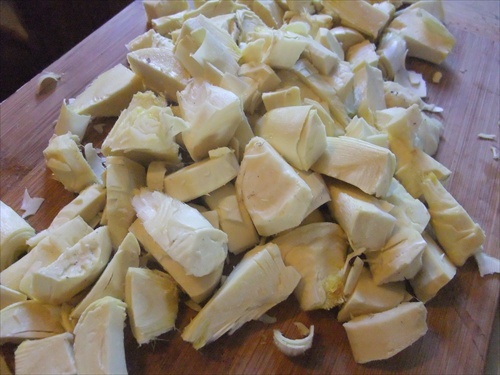 Rather than freeze these, I decided to make a traditional English pickle, substituting bamboo for cauliflower. 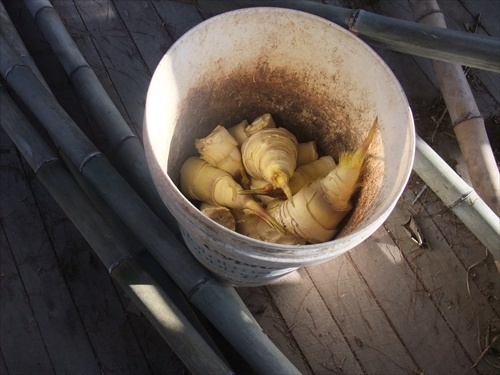 I’ve tried to ferment bamboo shoots to make a kind of Asian pickle, but the results were foul. 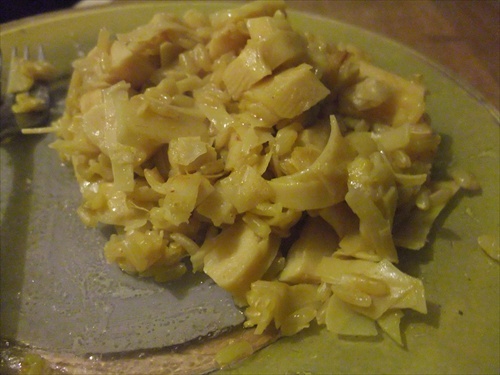 I used a kimchee-style treatement, but what works for cabbage doesn’t work for moso shoots. 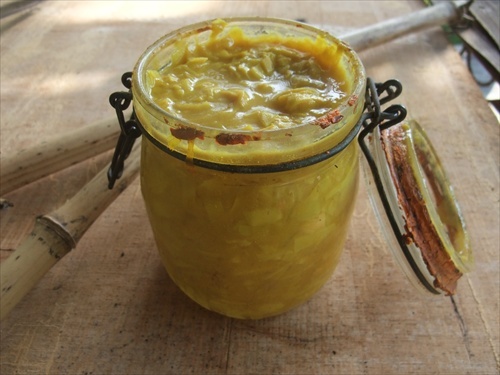 For classical English piccalilli, it’s normal to soak the vegetables raw in a strong brine before cooking them a little with the floury pickling sauce. 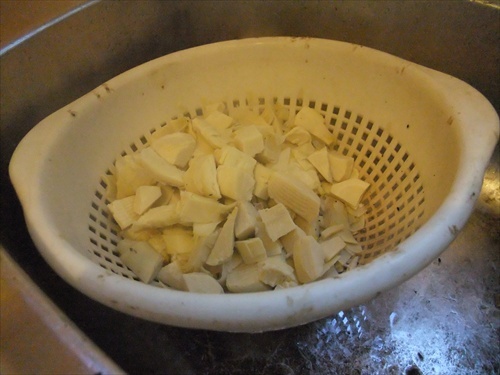 Obviously, moso bamboo shoots must always be blanched before anything else is done with them, so I briefly pressure-cooked them in unsalted water with some bamboo charcoal before placing them in brine with the raw onions. Also, because bamboo is very absorptive, whether as charcoal or shoots, I used a lighter brine. Apart from that, procedure was as usual. 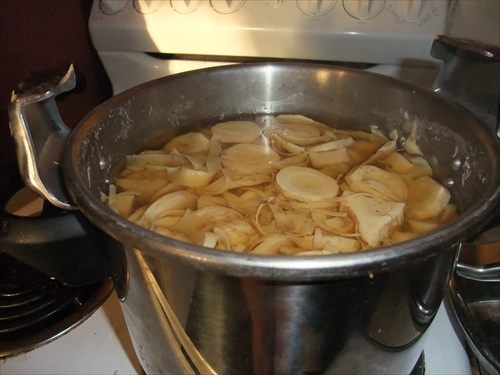 The brine is ditched and replaced with vinegar, to the level of the shoots in the pot. A paste of flour, turmeric and mustard is added, as well as sugar and some ginger. 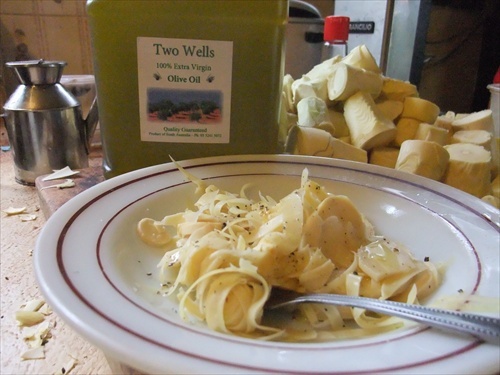 The whole is cooked gently for half an hour, till a saucey consistency is achieved, with no floury taste. 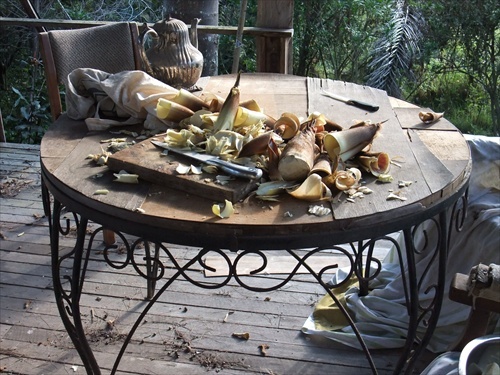 …there are no bamboo shoots. 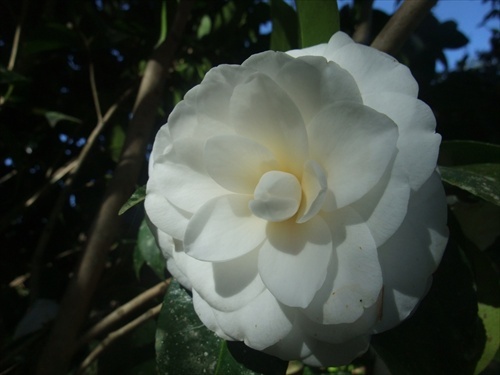 This year, however, there has been abundant rain all through winter and into spring. The spring equinox, only days away, should bring a mad upthrust of large shoots, but some have already made an appearance. These are not the rare, inconspicuous winter shoots which are delicious, and whose generative purpose I do not know, since they do not turn into culms. No, for over a week, I’ve been able to harvest spring shoots from under the power lines. I’ve never had conditions this good, and climate seems to be favouring moso more each year. Since 2007, there’s been a shift to more dominant ocean winds and generally higher humidity, even in the classically dry late winter, and even through the El Niño of ’09. In earlier posts I’ve explained that moso shoots need to be boiled up first and the cooking broth discarded. Quality can vary: my usually superb shoots are fine with just the one treatment in water with some salt, vinegar and dark sugar added. Then they can be frozen or added to a pot of just about anything. After long soaking, the chick peas are pressure cooked till tender. 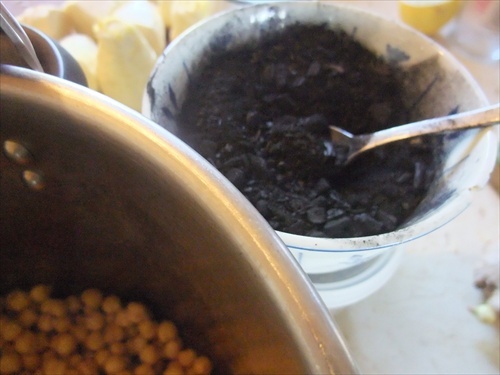 Just to show off, I add some bamboo charcoal, of which I have plenty. 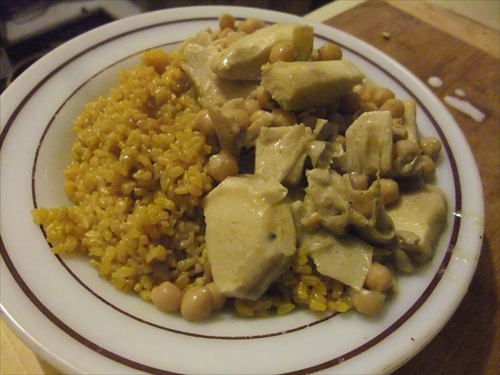 It’s a great water improver, and serves a similar purpose to bi-carb in the cooking of chick peas. 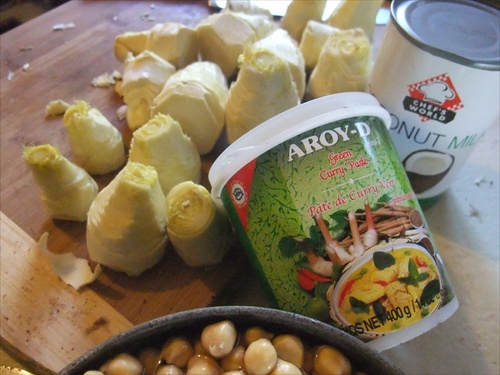 So, some Thai curry paste is fried hard in oil, vegetable stock is added, the pot hisses like a banshee. 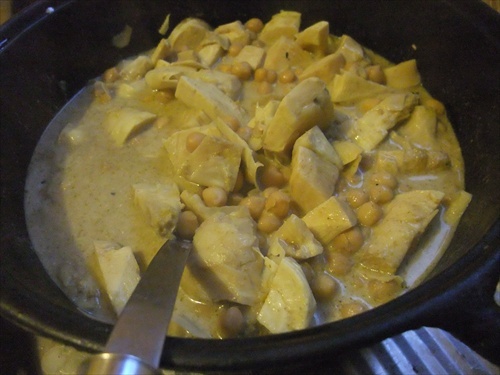 Next, the cooked chick peas and blanched, sliced moso shoots are added. Some interesting dark sugar is tossed in, and maybe some interesting citrus leaves. (My lemonade tree’s tender young leaves are good for this.) 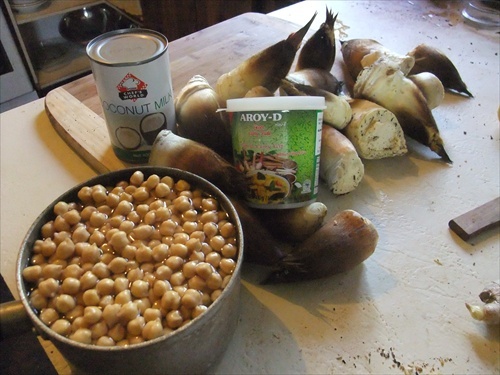 Near the end of cooking, coconut milk is mixed in. Serve with rice…cooked with a few slivers of bamboo charcoal, of course! Often you need meal ideas for guests of the vegetarian persuasion. Not so bad, if you remember you’re feeding humans, not koalas or aphids. Certain all-veg concoctions – like a cheese-flecked pasta e fagioli glistening with olive oil – can satisfy even the most determined carnivores. 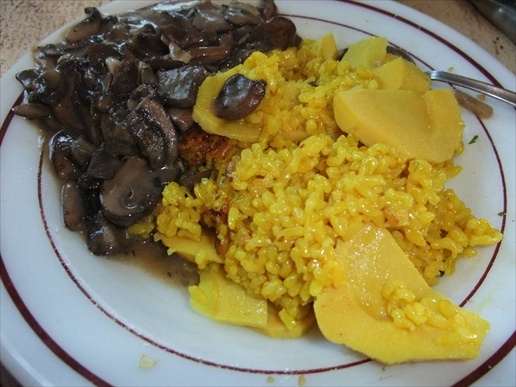 In my valley, the combination of brown rice, bamboo shoots and mushrooms works as well for the meat-eaters as for those few vegetarians we haven’t shot yet…and whom we may even be required to entertain! Above are the steps necessary before freezing. 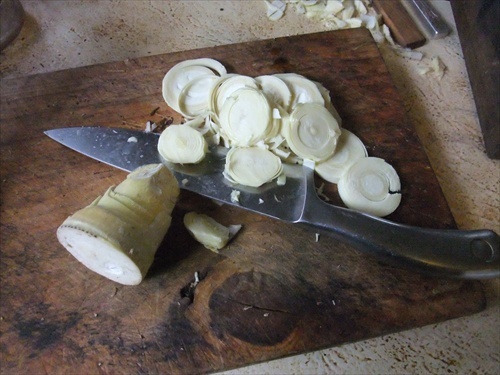 Don’t forget to blanch/precook the sliced shoots in lots of water – which I flavour with salt, brown sugar and vinegar – and to chuck out the water. When that’s done, bag ’em and freeze ’em. I’ve mentioned that moso shoots freeze well after the right prep. Another interesting quality is their ability to stay crisp after long cooking. 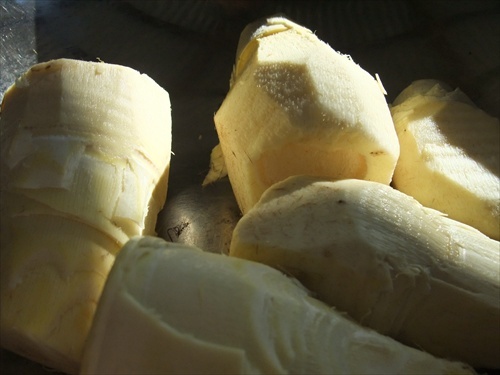 These freezer-stored shoots cooked with brown rice and turmeric were crunchily tender before being added to the pressure cooker along with the raw brown rice. At the end of cooking, they hadn’t changed much, either in consistency or flavour. Handy. 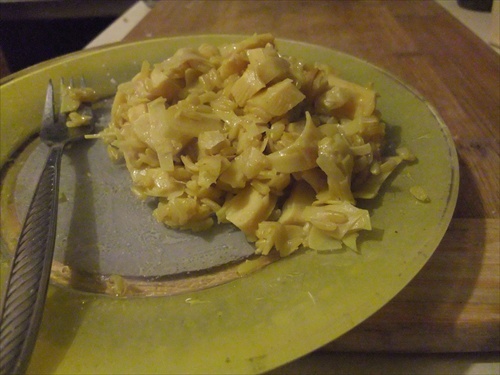 Pressure cook brown rice by absorption method, including plenty of frozen bamboo shoots. Seasoning should include turmeric, and I like to add Aussie mustard oil for its buttery quality. 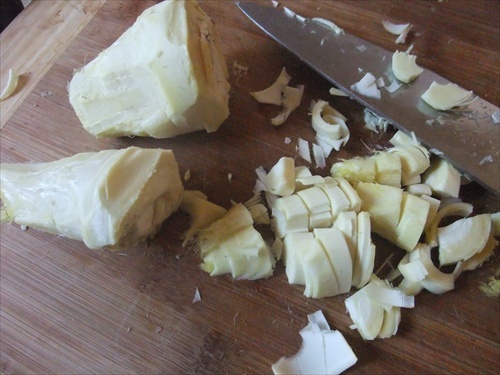 For meaty mushroom sauce, cook lots of garlic in lots of butter then add heaps of raw sliced mushroom. When that’s fried down, a dusting of flour is cooked in for a bit, then a small amount of vegetable stock is added. Simmer till saucy. All sorts of other good things can be added: parsley, coriander seed, chili go well with mushrooms. Trust me, vegetarian or not, they’ll lick the glaze off the plates.